Today was the 8th anniversary of the day when Owner and i first met in person. Each year we have a little routine which sees us return to the same tube station where we first clapped eyes on one another (Bond Street) and then we head off for a meal at the same restaurant we visited that same day 8 years ago. However, this year Owner decided to give the occasion a little twist by instructing that i was to pose as a Bond girl in the tube station. i also opted for the pretend i am holding a gun just by using my fingers pose as these days getting out a toy plastic gun on the tube probably risks a whole heap of trouble! We both also had a lovely meal at the Italian restaurant and i stumbled across the most delightful little dress in a shop just outside, i'd so love that dress! Sorry it has been a while again since my last post. We've been entertaining relatives and then travelling a bit ourselves and generally not feeling our usual selves. However, we have a slightly more normal period coming up when hopefully we can get back to being our usual selves and doing our usual routines. i also hope to get my lovely belly ring fitted next Friday which i can't wait to show off to the world. Hope all is well with you wherever you are reading this in the world. And lastly, for Owner, thank you for the best 8 years of my life...you are quite simply amazing and i love you with all my heart. My apologies for the recent lack of posts, we have had Owners parents staying over with us for a short while on a visit to London - which went really well. Just before they arrived Owner received the excellent news that Her job was safe - She even gets a swanky new title - however, the company managed to run such a cack-handed and dubious 'process' that it has left Her and Her colleagues feeling very bitter about the whole thing. Still, Her job is secure which is great news in these times. As i said at the outset we have also had Owners parents staying with us. Their visit went much more successfully than either Owner or i could have imagined. It did, however, mean time for me without my collar or any obvious make-up which left me feeling very naked and somewhat bereft. The worst moments though where when i was accompanying Owner and Her mother around clothes shops and markets and was desperately trying not to look too excited and interested at all of the delightful and pretty items that were on sale! However, we now both have our flat back to ourselves and so 'normality' can once again return and the toys can come back out from their hiding places in the loft. Lovely as it has been to have Owners parents staying with us we are both delighted to now be back on our own. We are now both excited at the prospect of my getting my belly pierced so that i can wear my super cute dangly rings. 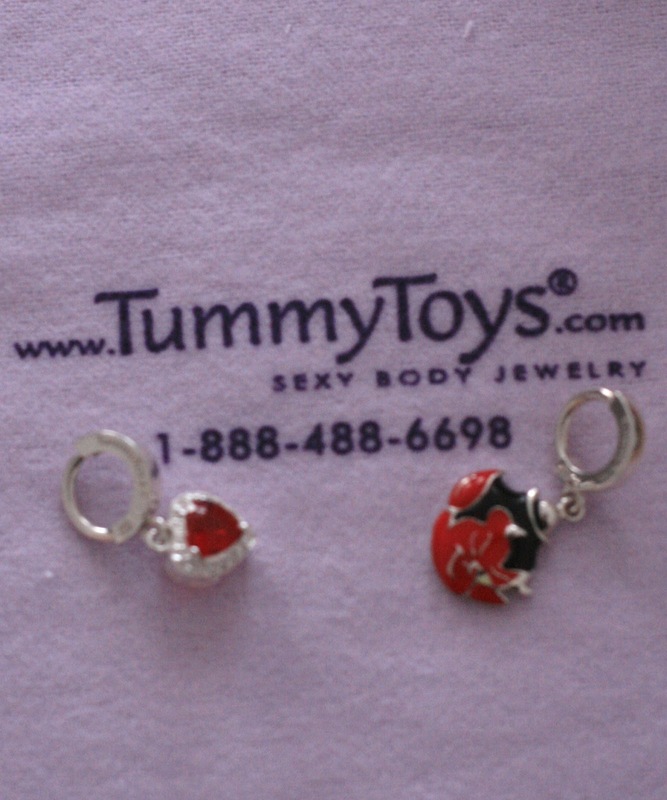 Both rings came from Tummy Toys. Also, now that the uncertainty around Owners job is behind Her we can continue with planning some of the, to us at least, exciting and dramatic developments we have planed for later this year.